Triple Threat: As Easy As 1,2,3! 3. Effective with the highest number of pests. We strongly recommend that you choose beneficial nematodes based upon the target pest and level of infestation. However, when you have multiple pest species, certain pests that have mobile and immobile stages or you have an unidentifiable combination we recommend using the Triple Threat. Sf are nicknamed NemAttack but formally they are Steinernema feltiae. Sc are nicknamed NemAttack but formally they are Steinernema carpocapsae. Hb are nicknamed the NemaSeek but formally they are Heterorhabditis bacteriaphora. For example, if you have fleas and ticks – the triple threat is your best option for controlling multiple stages of development that range from low mobility to high mobility. For instance, the Sf go after the very mobile adult fleas while the Sc go after the less mobile larval and pupae stages of the flea. The Hb and the Sf go after the various life cycles and feeding stages of ticks. Another scenario for the Triple Threat is a vegetable garden that is limited in size or limited in options for crop rotation. Before you plant in spring or early summer, apply the Triple Threat to eliminate the pest insects that have over-wintered in your soil before they destroy your spring and summer fruits and vegetables. Finally, if you are a new gardener and you don’t know exactly which pests you have – applying the Triple Threat is smart. You cannot over apply beneficial nematodes and it can be safer to apply all three varieties instead of guessing and using trial and error while your garden and lawn are being consumed by pests. The 1/2 Garden size covers 1,600 square feet, the SKU# is 1220328. The Garden size covers 3,200 square feet. The SKU# is 1220330. The Farm size covers 1 acre. The SKU for the Farm size is 1220329. The Small Ranch size covers up to 5 acres, the SKU# is 1220327. 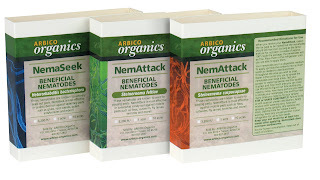 Remember, you cannot over-apply beneficial nematodes – so don’t worry about having too many. For maximum effect, order enough to fully cover your area. All varieties of the nematodes can be applied at the same time – just mix them together and look for the results! we people should know how to control some insects inside our house specially mosquitoes..they bring sickness and it can kill us also..
Stinky HE Washing Machine? We May Have a Cure!